Yesterday I was starving around 3:30 and remembered I hadn’t eaten lunch. I was already home for the day, so I decided to raid the kitchen. I found a bag of ricotta tortellini, but didn’t want to open a whole jar of sauce for myself. I had a vine tomato that needed to be used and some leftover feta but not much else. So out to my garden I went, cut some fresh basil and cilantro, chopped everything up, and voila! Instant pasta topping. It may not have been fancy, but it was delicious. 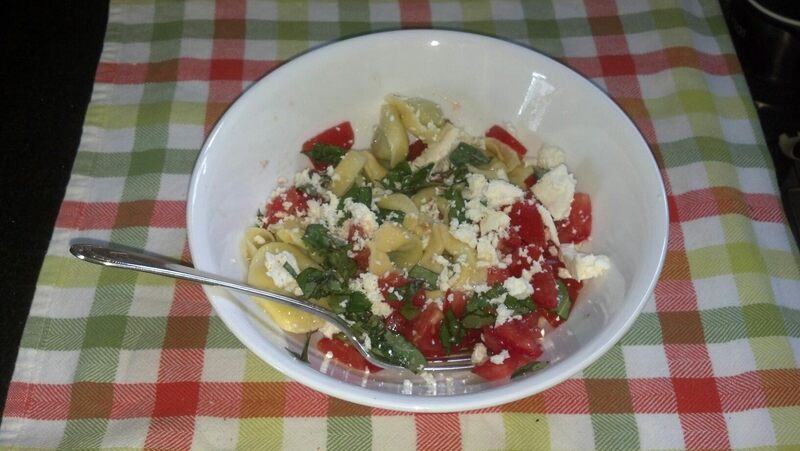 Nothing is better than fresh basil with pasta. I love having fresh herbs growing just a few feet from my kitchen.